IBM® DB2® buffer pools are still a key resource for ensuring good performance. This has become increasingly important as the difference between processor speed and disk response time for a random access I/O widens in each new generation of processor. An IBM System z® processor can be configured with large amounts of storage, which if used wisely, can help compensate by using storage to avoid synchronous I/O. 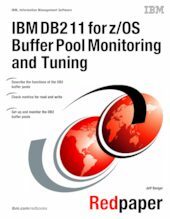 Several changes in buffer pool management have been provided by DB2 10 and DB2 11. The paper is intended to be read by DB2 system administrators, but it might be of interest to any IBM z/OS® performance specialist. It is assumed that the reader is familiar with DB2 and performance tuning. In this paper, we also assume that you are familiar with DB2 11 for z/OS performance. See DB2 11 for z/OS Technical Overview, SG24-8180; and DB2 11 for z/OS Performance Topics, SG24-8222, for more information about DB2 11 functions and their performance.